Because the body functions like a hologram. And what is a hologram, you might ask? Essentially it is a 3-dimensional image stored on a photographic plate. When a laser is shined through the plate, the image is projected in 3-D. Interestingly, you can get the same image by shining the laser thorough only a small segment of the plate. This means that all the information for creating the image is stored in each and every part of the plate. Through centuries of observation and experimentation, the Chinese discovered each part of the body is reflected in every other part of the body, in the same manner as a hologram. This is why any small part of the body, like the ear, contains all the information needed to treat the whole body and make it healthier. Body parts like the ear are called microsystems. There are several microsystems commonly used in the acupuncture clinic. And why would this interest you? Well, acupuncture is ancient, but in some ways very modern. The science of holography was not developed till the mid 20th century, but the concept and its application in acupuncture was discovered by the Chinese long before. In the same way, the idea of the body being both matter and energy anticipated modern physics by centuries. 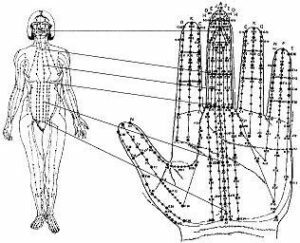 The fact that the mysteries of the ancient art of acupuncture are being confirmed by modern science increases one’s respect for it. For the intellectually curious, there is more information in this longer article, including a discussion of various microsystems.